If you look under the football section on the Louisiana High School Athletic Association’s website, it says the first official day of football practice is today. However, most coaches considered last week the first real week of practice following offseason summer workouts. But if football means the popping of shoulder pads and other sounds of players banging into each other, then this really is the first week. 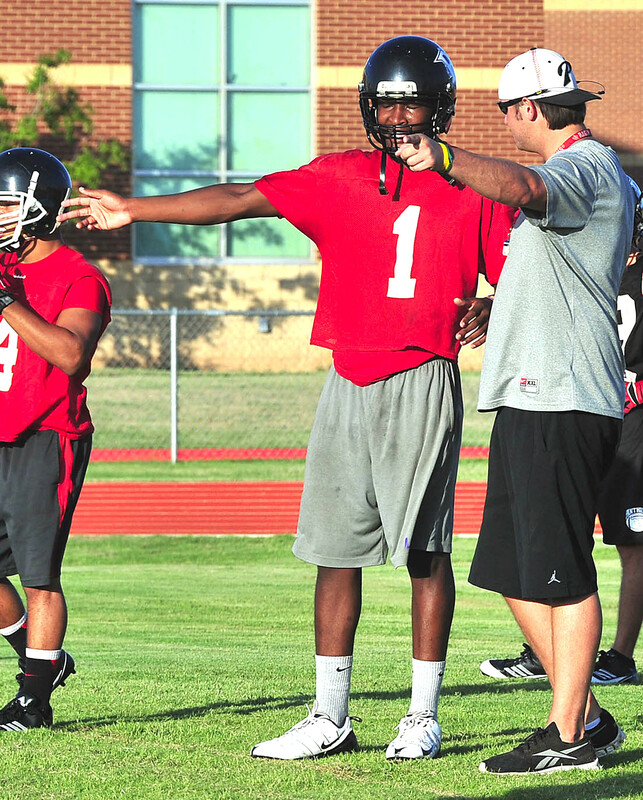 Parkway quarterback Brandon Harris talks to a coach during practice. Last week, players were allowed to practice in only shorts, shirts and helmets, which they’ve basically been able to do all summer. Today, they can put on the pads. “We’ll ease into the full speed tackling,” first-year Benton coach Reynolds Moore said. “We’ll take Monday and do a review of form tackling. We’ll do some tackling drills just to remind them of things like keeping their head up, safety issues, things like that. Then we’ll work some tackling drills — sideline tackles or open field tackles as a refresher. Then after we do that we’ll continue all season to incorporate that into our individual time and individual drills. Louisiana New Tech at Plain Dealing coach Coy Brotherton said he’ll have his players start wearing shoulder pads today. Brotherton said there will be “a little banging,” but that won’t be the main focus. “We’re still trying to get them accustomed to the heat,” Brotherton said. Last week, teams practiced in temperatures at or near 100. This week, they may get a little bit of a break. High temperatures are forecast to drop as the week goes along. A week from the Thursday, the Lions will scrimmage Fair Park at Independence Stadium. “We’re going to treat that like a game week,” Brotherton said.